First mix together the Elmer's glue and the 1 cup of warm water. Stir in the paint and food coloring. In a separate small bowl mix together the 1/3 cup warm water and 2 teaspoons of borax. Stir until the borax is dissolved. Now add about 2 tablespoons of the borax solution to the glue solution. You WILL NOT use all of the borax solution. Stir continuously while adding the solution. The more borax solution you add the stiffer the slime will be. So if you want the slim to be more runny, then add less borax solution. You can add more green food coloring while stirring these solutions together to get your desired color of slime! It should start sticking together and you've got green glow-in-the-dark slime! 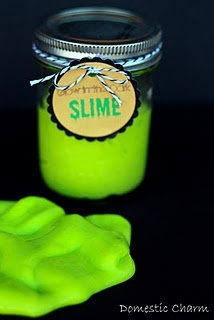 This recipe can make 2 small half jar fulls of slime or your could package a smaller amount of slime into favor baggies. TIPS: You can find glow-in-dark-paint at craft stores in the paint isles, and borax can be found at most grocery stores along side the laundry detergents. Also make sure to check the paint that you buy to see that it is safe to use for the project. This slime would not be suitable for small children who might put some in their mouth.